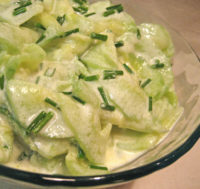 Creamy Cucumber Salad; shoes? please! This is a summer classic, loosely based on my mother’s recipe…. Which was her mother’s. She used cream, I use yogurt but the taste is surprisingly similar. 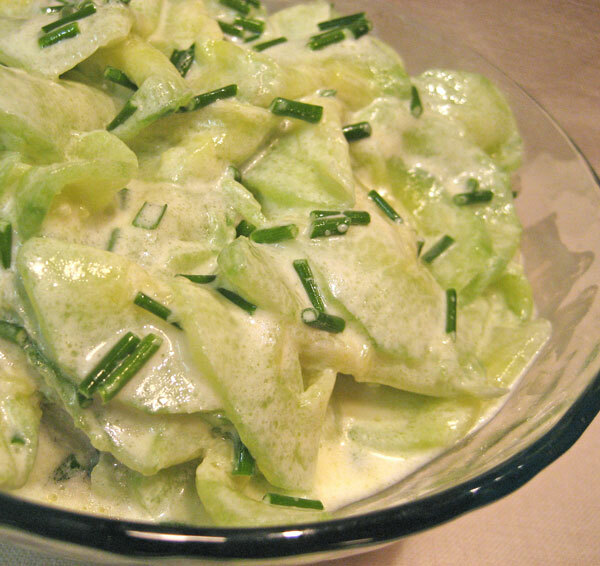 She made cucumber salad several times each summer. So do I, although not always the same recipe. 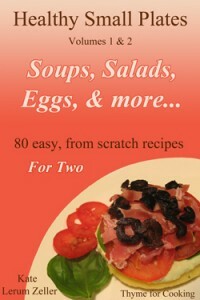 She liked it best as a topping on baked or boiled potatoes. I don’t bake or boil potatoes in the summer. I like it best standing in front of an open fridge with a fork. It’s also a great side dish. The best part is it’s one of those dishes that just keeps getting better – but it never lasts long at our house. I can’t be real specific on the quantities here…. I depends on how big the cucumbers are, etc. It’s an easy ‘taste and adjust’ salad. Just play with it until you like it – you really can’t screw it up (unless you try to hurry). Peel cucumber and thinly slice on box slicer or mandolin. Stick 2 whole cloves into each onion half. Put the studded onion in the bottom of a deep bowl large enough to easily hold the cucumber. Put in a layer of cucumbers, sprinkle with salt, and repeat 3 times using about 1 tsp salt on each layer. Put a small plate or saucer on top of the cucumbers – it should be sitting on the cucumbers not resting on the sides of the bowl. Put a big can or jar or something heavy on the plate. We want weight on the cucumbers – the plate is just to distribute it more evenly. Let it sit at room temperature for 4 – 10 hours. Remove weight and plate. The cucumbers will be sitting in a lot of water. Put cucumbers in a strainer – discarding onion and cloves. Rinse cucumbers. You don’t want to get all of the salt off – just about 80% Taste to test. When rinsed to your satisfaction take the cucumbers in your clean hands and gently squeeze most of the remaining liquid out. Put back into the bowl (that you have rinsed). Add 2 tbs lemon juice, 3 tbs oil and stir. Add 1/3 cup yogurt, stir and taste. Adjust to the quantity of cucumbers and your liking. Add fresh ground pepper, chives and serve. One of the first things I tell guests at our house is to keep their shoes on. The other is the lizards, but that’s another story…. This story is about champagne bottles. The first spring we were here, after we cleared all the weeds off the front lawn, I noticed a lot of bees under the fig trees. I was doing all the mowing at the time and when I was in that corner of the lawn the bees were not pleased. I was not pleased that the bees were unhappy. There was a hole in the ground that they were going in and out of. Eventually, the bees moved on but the hole remained. It was a champagne bottle. Further investigation revealed 2 rows of champagne bottles, buried vertically, neck down. There were about 20 bottles in 2 perfectly straight parallel rows. We have absolutely no idea why. My best guess is an amateur paleontologist decided to play a prank on some paleontologist 5,000 years in the future. We dug out all of the champagne bottles. Yesterday, I was walking back from the herb garden (same corner) and saw something sticking up out of the dirt. It was a 4 inch long edge of green glass. I couldn’t pull it out so I got the digger. It was part of a champagne bottle. 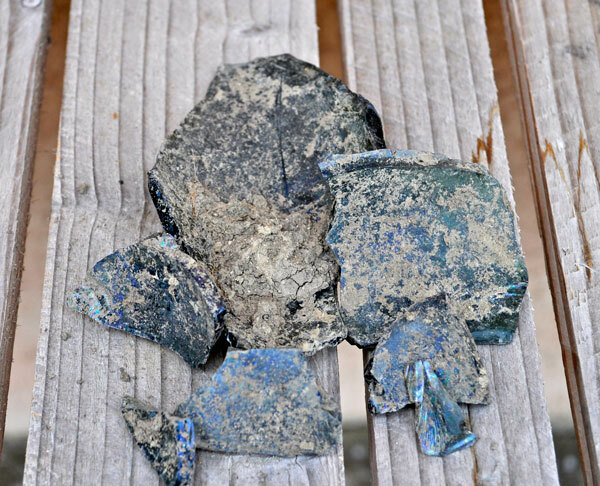 The trove of glass in the photo is what I found in that spot. I didn’t look for more although I probably should. Any one of the pieces could do a lot of damage to a bare foot – or paw. On the positive side glass is a lot better than the rusty knives I usually find working their way to the surface. Never a dull (?) moment here in the middle of nowhere…..
Maybe there is a treasure chest there somewhere with old money in it! Vladimir was telling me that when the big rush to get out of Cuba in 1958/59 people buried money in tin boxes in their properties. They must have thought that they were coming back at some time. Now the builders are finding some of the boxes when they are renovating. If you ever figure out why the bottles were there, if love to know! A mystery. I make cukes sort of like that, but not the cream. I slice my onions thin, peel and slice the cukes, layer, salt and let them sit like you do, but I don’t rinse them. I just squeeze them really hard until the remaining moisture is almost gone, then into a bowl with a little white vinegar and a dash of sugar and a bit of pepper. Same idea, they don’t last long and we stand in front of the open fridge eating them half the time. I’m not big on cloves, but I’ll have to try them this way because…cucumbers! Evelyn, I keep thinking that someday I’ll find something of value, but so far…. Nothing! nightsmusic, well that might have been useful! We’ve grown lots of rusty knives and even a plowshare once, My mother always put onions in hers but I content myself with the chives, Maybe I’ll try some red onions next time – they seem to be milder. What a great story about the champagne bottles. I hope you find out the mystery some day. I love this salad recipe. It’s a bit like tzatziki but also like some of the northern European cucumber salads I often eat (like the one nightmusic mentioned for example) A perfect marriage you might say.